Singapore, one of the greatest economic success stories in history, is losing its competitiveness. While the economy continues to grow, the pace of that growth has stagnated. Having expanded at an average of 7.7 per cent since independence in 1965, gross domestic product (GDP) growth decreased from 4.7 per cent in 2013 to 2 per cent in 2015 and 1.8 per cent last year. The growth rate is now comparable to those of Australia, Hong Kong and South Korea but many competing economies in the region outpace Singapore, including Indonesia (4.8 per cent), China (6.9 per cent) and India (7.6 per cent). At the core of this tempering of growth is a slowdown in productivity. Though wages continue to rise, overall labour productivity is on the decline. For the top 100 companies on the Singapore Exchange, return on equity shrank from 24 per cent in 2011 to 11.4 per cent in 2015, while return on capital decreased from 9.8 per cent to 6.8 per cent. Profit per employee contracted at an annual rate of 9.5 per cent over this period - not only due to operational costs rising, but also due to a fall in revenue generated per full-time worker. Growing global uncertainties make it harder for Singapore to look overseas for support in lifting GDP growth. The prospect of less globalisation and more protectionist economics in Europe and the United States will slow down cross-border flows of goods, services and capital. 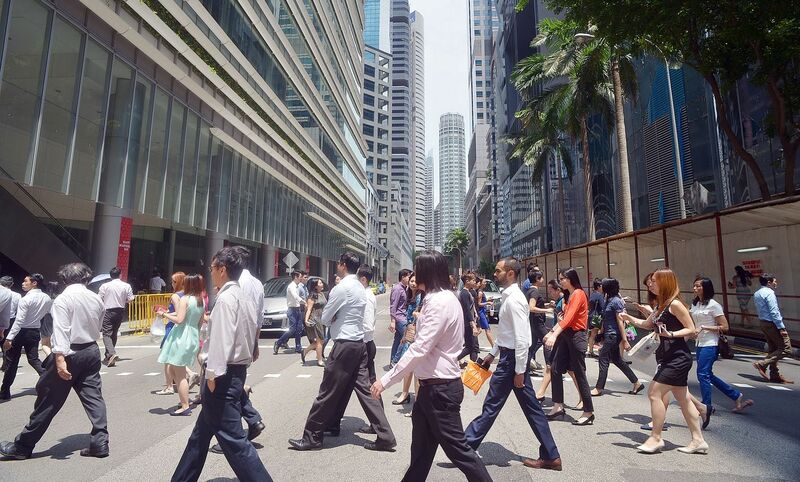 Increased digitisation and automation can enhance productivity per employee but could also drive a sharp rise in unemployment, leading to challenging social consequences for Singapore and its neighbours. In response, the Government has implemented many initiatives over the last five years to boost productivity and set an example through productivity improvements in several of its own departments. However, country-wide impacts to date have been mixed. A recent analysis by the Ministry of Trade and Industry shows that real value added per worker declined by 0.5 per cent in 2014, and by 0.1 per cent in 2015. At the same time, wages continue to rise. In fact, between 2004 and 2014, average wages rose nine times faster in Singapore than they did in Hong Kong and South Korea. It is now time for Singaporean private-sector companies to tackle the productivity challenge head-on. A much-debated area is small and medium-sized enterprises (SMEs) and their need to innovate better - an understandable focus given the importance of SMEs to the Singapore economy. For larger companies, shareholder expectations, competitive pressures and broader social objectives provide incentives, oversight and guidance to institutions which are better equipped organically to address the issues. Yet, many large Singaporean companies are not embracing all the tools at hand for improving productivity. Singapore's industrial and financial champions need to be bolder. They should embody the same pioneering spirit which got Singapore to where it is today and revisit fundamental business assumptions and start viewing productivity through a more multi-dimensional lens rather than pure cost effectiveness. First and foremost, this requires a willingness to use more outsourcing or partnering for non-core expertise while doubling down on what the company does best; using this to get a much clearer understanding of the future skills needed and focus on workforce planning; and replacing standard "Six Sigma style" process efficiency drives with more innovative solutions which target future customer needs. Many Singaporean organisations would benefit from increased workforce engagement to get more out of their talent, encouraging more contributions to shaping the company's future. Involvement in planning, rewarding innovative ideas about product or process improvements, and giving a bigger voice to the young would improve preparation for the future... Ultimately, a degree of cultural evolution and flexible development of talent will support future growth and lead to a competitive edge through organisational agility. Many Singaporean organisations would benefit from increased workforce engagement to get more out of their talent, encouraging more contributions to shaping the company's future. Involvement in planning, rewarding innovative ideas about product or process improvements, and giving a bigger voice to the young would improve preparation for the future. Chief executives and human resource leaders also need to take a stronger and more visible lead in raising the skills, effectiveness and productivity of individual employees, publicly rewarding success. Ultimately, a degree of cultural evolution and flexible development of talent will support future growth and lead to a competitive edge through organisational agility. Armed with a tradition for being adaptable and equipped with an effective public policy and legal framework, Singapore is in a good position to support its leading institutions in making rapid progress in these areas. This will help generate economic returns at the company level and make the firms more competitive, while having positive societal impacts as skills are upgraded and potential job losses avoided. There may also be further knock-on effects as successful pioneering by larger companies will set an example for smaller companies to follow. This will not be an easy journey. It will require strong collective leadership and commitment, a willingness to challenge conventional wisdom, and structural but flexible frameworks enabling employee growth and development. Done right, there is tremendous upside for companies to realise the untapped productivity potential. Done wrong or ignored, and an opportunity to make a dent in the low-growth trend for Singapore could be missed. The writer is partner and head of Asean at Oliver Wyman and a Singapore permanent resident.